Grand Ridge is a really interesting Victorian craft brewery. It's one of the older craft breweries in this state, first brewing beer in 1989. I picked up this beer the other day because I'd never seen it before and am quite partial to the odd Black & Tan. For those unfamiliar with the term/style of Black & Tan here's a quick run down. Basically they are a mix of a dark ale or stout and a lighter ale (and in some countries lager), hence the name. My first ever Black & Tan was in Prague about 4 years ago, which was a mix of dark lager and a regular pilsner - I've been hooked since. I can't recall seeing a pre-packaged one before so I'm looking forward to trying this one. This beer poured as expected with element of both light and dark beer being evident. 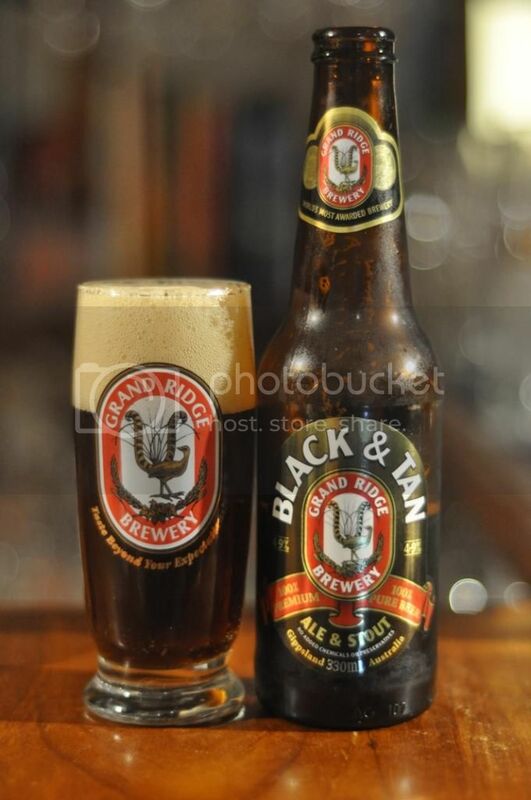 Grand Ridge's example of the style has a slightly reddish brown colour to the beer and is quite clear. The head is quite large in this glass and is a creamy looking colour. The retention of the head is good, if not spectacular, however there is almost no lacing. Black & Tan from Grand Ridge unfortunately tastes a bit like the aroma indicated. There is alot of stuff going on, however none of it is particularly nice. The caramel malts are more pronounced than the roasted ones while the hops are only just evident. The sour cherry and dark fruit flavours are again present but not really strong enough to make a good impression. All the flavours sort of mix into each other and get lost.